Tis the season for baking cookies! As you definitely know by now, our family loves to bake and I love getting my kids in the kitchen with me whenever I can. Learning to cook and bake is a gift that they’ll be able to use their whole life, and as an added bonus it helps ensure a positive relationship with food and builds self confidence. 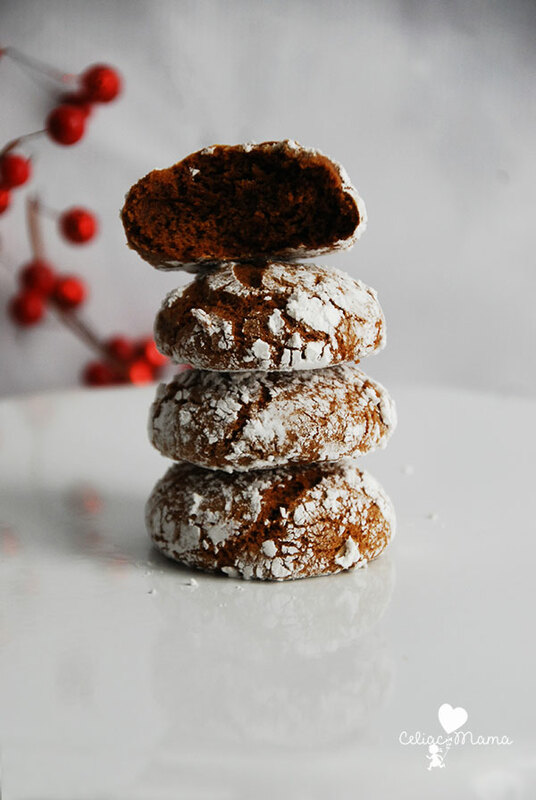 With the holiday spirit running strong through our house right now, we decided to work on some new cookie recipes. 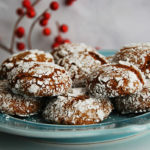 The first one we’re sharing is Gluten Free Ginger Crinkle Cookies! How did we come up with the idea? Simple! Our recipes often start from foods that my kids see at parties or school that aren’t safe for them to eat, and this was no different. 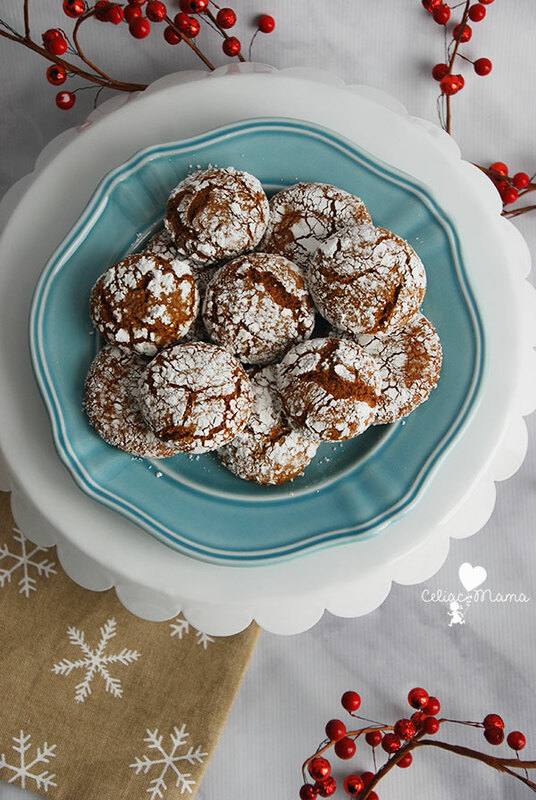 Last week, my daughter saw a crinkle cookie and thought it looked “SO COOL.” So, we decided to marry the crinkle concept with a favorite holiday flavor of gingerbread to create Gluten Free Ginger Crinkle Cookies. I have to say, we had a blast!! Watching my kids roll the dough into little balls and then cover them with powdered sugar was absolutely adorable. It was messy, it was fun and definitely a great memory we made together. You might also be interested to know that the cookies are totally delicious!! First, you’ll add the coconut oil, egg, coconut palm sugar, and molasses to your mixing bowl. Mix on low until well combined. In a separate bowl, mix the flours, ginger, cinnamon, cloves, and baking soda. Slowly pour the dry mixture into the mixing bowl with wet ingredients continuing to mix it on low for a minute. Turn it to medium low and add water to the bowl. Spread a piece of plastic wrap on the counter. Remove the dough from the mixing bowl with a spatula – should be smooth, sticky and thick – and place it on the plastic wrap. Form the dough into a ball and then wrap the plastic wrap up so that it’s tightly covered. Place the dough in the fridge for an hour. 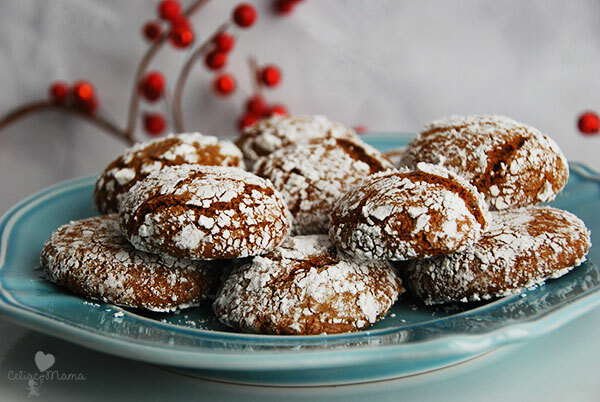 Add powdered sugar to a wide rimmed bowl, and lay out a piece of parchment paper. Remove the dough from the freezer and unwrap it. Take small pieces of the dough and roll them in your hands to make a circle shape. They should be about 1 1/2 inches in diameter. Place the cookie dough ball into the powdered sugar bowl and turn it with a fork to make sure it’s fully covered with powdered sugar. Place on parchment paper and repeat the above steps, placing each cookie an inch apart. Continue until you’ve used all of the dough to make 24 cookies. When finished, slide your baking sheet under the parchment paper. Chill the dough for at least an hour before you start forming the cookies. This helps to reduce the stickiness of the dough. If the dough is sticking to your hands when you are rolling it into balls, dust your hand with powdered sugar. It will help act as a barrier to keep it from sticking. If you don’t want to make 24 cookies, save half of the dough for later. It freezes well for weeks, so just leave half of it in the freezer until you’re ready to use it. I hope you enjoy the recipe as much as we do! Happy Holidays from our family to yours!! 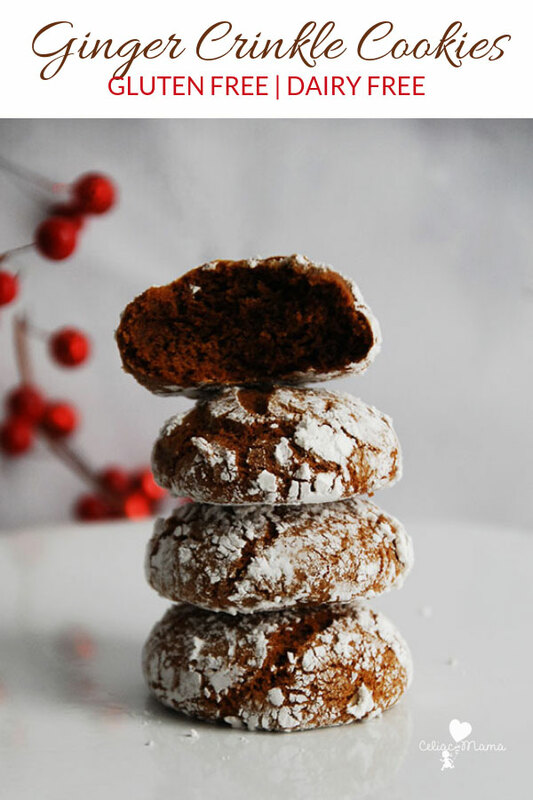 Want more holiday cookie recipes? Try our cut out sugar cookies and gingerbread men cookies. This recipe is both gluten free and dairy free. It makes 24 cookies. Add the coconut oil, egg, coconut palm sugar, and molasses to your mixing bowl. Mix on low until well combined. Remove the dough from the mixing bowl with a spatula - should be smooth, sticky and thick - and place it on the plastic wrap. Form the dough into a ball and then wrap the plastic wrap up so that it's tightly covered. Take small pieces of cookie dough and roll them in your hands to make a circle shape. They should be about 1 1/2 inches in diameter. Place the cookie dough ball into the powdered sugar bowl and turn it with a fork to make sure it's fully covered with powdered sugar. Place the cookie on parchment paper and repeat the above steps, placing each cookie an inch apart. Continue until you've used all of the dough. If you prefer a flatter cookie, press down on the center of the cookie dough ball lightly with your thumb before putting the cookies in the oven. If you don't want to make 24 cookies, save half of the dough for later. It freezes well for weeks, so just leave half of it in the freezer until you're ready to use it.